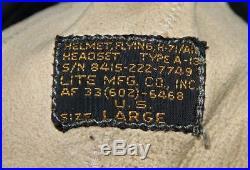 NICE, ORIGINAL KOREAN WAR U. 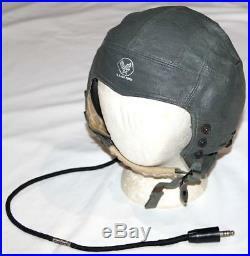 AIR FORCE A-13 LEATHER FLIGHT HELMET WITH H-71/AIC HEADPHONES. 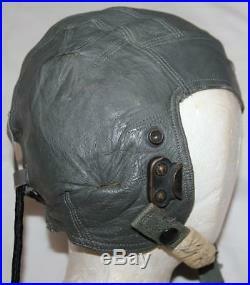 THE GRAY LEATHER IS STILL SOFT AND SUPPLE WITH A NICE USAF DECAL TO THE FRONT. 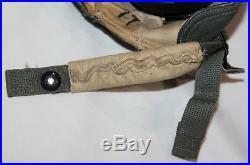 THE CHAMOIS LEATHER LINER IS ALSO SOFT AND SUPPLE AND SHOWS LIGHT STAINING. THE CHINSTRAP IS COMPLETE AND THERE IS AN OXYGEN MASK CLIP ON THE RIGHT SIDE. THE RUBBER COVERING ON THE EARPHONES IS STILL SOFT AND PLIABLE. WELL MARKED CORD AND PLUG-IN. 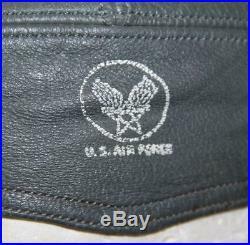 SHOWS AVERAGE USE AND WEAR WITH LIGHT STAINING, HAS A SMALL SEAM SEPARATION ON THE CENTER, REAR SEAM AND HAS A NAME INKED INSIDE. 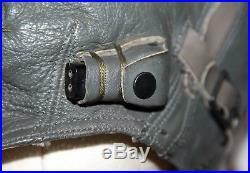 SEE PHOTOS ABOVE FOR DETAILS. GOOD CONDITION AND DISPLAYS WELL. IF THERE IS ANY PROBLEM AT ALL, FEEL FREE TO CONTACT ME. 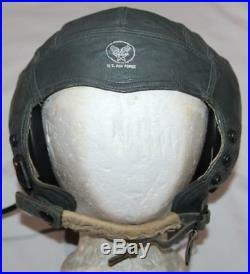 The item "NICE, ORIGINAL KOREAN WAR USAF A-13 LEATHER FLIGHT HELMET With H-71/AIC HEADPHONES" is in sale since Wednesday, July 25, 2018. 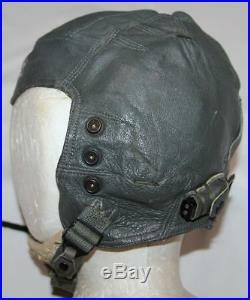 This item is in the category "Collectibles\Militaria\Korea (1950-53)\Original Period Items". 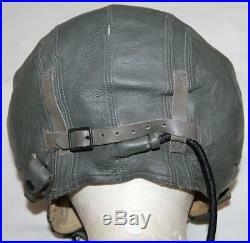 The seller is "bbmilitaria" and is located in Grand Island, Nebraska. This item can be shipped to United States, Canada, United Kingdom, Denmark, Romania, Slovakia, Bulgaria, Czech republic, Finland, Hungary, Latvia, Lithuania, Malta, Estonia, Australia, Greece, Portugal, Cyprus, Slovenia, Japan, Sweden, South Korea, Indonesia, Taiwan, Thailand, Belgium, France, Hong Kong, Ireland, Netherlands, Poland, Spain, Italy, Germany, Austria, Israel, Mexico, New Zealand, Philippines, Singapore, Switzerland, Norway, Saudi arabia, Ukraine, United arab emirates, Qatar, Kuwait, Bahrain, Croatia, Malaysia, Chile, Colombia, Costa rica, Dominican republic, Panama, Trinidad and tobago, Guatemala, El salvador, Honduras, Jamaica.